If you are familiar with Santa Fe at all, you know of our Native American, Mexican, and Spanish roots. Designated as a Creative City by the United Nations Educational, Scientific and Cultural Organization, Santa Fe is recognized as a cultural melting-pot that supports and promotes our residents' creative art products, and hosts a variety of events to showcase this very creative side of our city. 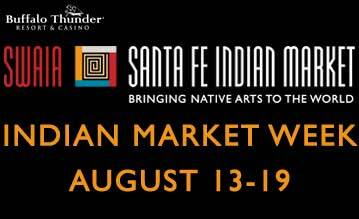 In this spirit, we invite you to be our guests between August 13-19, 2012 during this year's Santa Fe Indian Market! Hosted by the Southwestern Association for Indian Arts (SWAIA) at the downtown Santa Fe plaza, this prestigious Native arts market and festival is now in its 91st year. This event is technically much more than a "simple" crafts and folk art fair: this week-long series of events includes programs, lectures, films, readings, book signings, art awards, live performances, auction gala, and more are all part of one big celebration culminating in the Market itself! Whether it be jewelry, paining, pottery, textiles, wood, baskets, or something else entirely, you'll definitely find a reason to incorporate Native American art into your life during this week. Over 1,100 artists from more than 100 tribes located all over the country and Canada offer their original artwork and creations. The Market expects to see over 100,000 visitors from all over the world, making it the the largest cultural event in the southwest United States! And no celebration is complete without food and drink. You'll find a varied and vast selection of both traditional and contemporary Native foods. From pemmican to Nokake to frybread; soups and dishes potentially featuring mutton, buffalo, and salmon; and a variety of offerings containing berries, whole grains, and squash, you'll likely find it all at the Market. Pair all that with versions of morada drinks and teas, and you have a complete culinary experience! Not only does the event satisfy the public's want of Native American goods, art, and culture appreciation, but it also helps to further the careers of the artists and performers alike. Cartoonist Ricardo Cate, sculptor Michael Naranjo, and the Git-hoan Native Dance Group are just a few of the artists that have become more widely known, and will all be attending during the celebration. While the site lists the typical hotels in the area, we (of course) recommend the short drive to our bed and breakfast in, just 9 miles from downtown Sante Fe, for ideal accommodations. Take in the art, food, performances, and events during the day, and return to your inn home-away-from-home for a relaxing evening and a great night's rest. Why not extend your stay and enjoy a great New Mexico vacation? Either way, you'll be treated like family. Come discover why people love the Bobcat Inn! 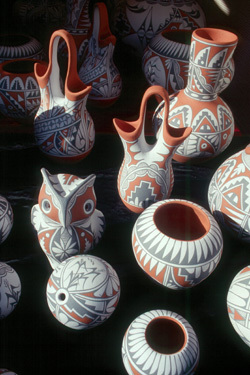 The Santa Fe Indian Market seems like a great place to enjoy some beautiful native American arts. The culinary portion seems pretty tasty as well. I'm always so enthralled to view Indian works, the lines, shapes, and colors are so calming and telling. This would be a great option for people of all ages to attend..
At Bescover there exists a community of B&B's put together by the Lanier Family. Over the past 30 years the Lanier’s have supported the marketing and technology needs of inn keepers around the world, and they also provide new technology tools such as free mobile sites for your inn. Please come and say hello, and if you ever need our help we are here for you.